Over the last two or three years, we have come to understand more of how prospective students use different online channels to seek out and select overseas study options. Indeed, there are a number of broad findings that emerge from analytics and also from an accumulation of student surveys. Different channels at different times: There is a distinction to be made between digital tools, such as online search and school selection sites, and social media. A 2015 Chegg study found that the former are highly influential in the discovery phase of students’ research, when they are learning about different institutions and trying to identify schools that could be a good fit. Social media comes into play after that initial discovery process as students further inform their choices. A big role for social: Needless to say, how and when students use social media varies from country to country. In some markets, such as China and Russia, homegrown social networks are the clear leaders – for example, WeChat and QQ (Qzone) in China and VK (VKontakte) in Russia. In other countries, the major global platforms dominate. Facebook, for instance, has been widely adopted in the Middle East, with 89% of web users active on the platform. Unbranded search: Google research consistently finds that unbranded search is very common in the early stages of prospective students’ discovery process. As many as 9 in 10 prospects don’t have a particular school in mind when they begin their search process and their search behaviour reflects this lack of brand orientation. Rather than searching for a specific institution, for example, prospects are far more likely to search by programme name or type, often in association with a particular country or region. Mobile first: Students use mobile devices heavily during the discovery phase of the college search process. In many markets, a majority of prospects make their first visits to college websites on their mobile devices, and significant proportions apply to institutions from their phones. Institutional websites must therefore deliver an excellent mobile device user experience. Key information – including programme, admissions, and student life details – must be easy to find, and key conversion points, including inquiry and application functions as well as a prominent “book now” or “apply now” button, need to be well optimised for mobile. A new report from QS adds to these findings with a survey of undergraduate prospects in the UK. 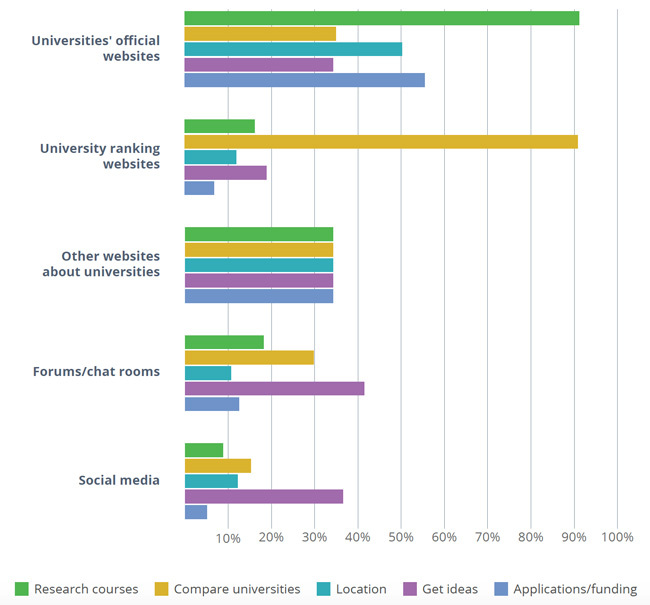 Keeping in mind the market variations that we noted above, How Do Millennials Research University: The Online Journey for Prospective Undergraduate Students in the UK nevertheless provides some interesting insights into the role and importance of key online channels in students’ search and selection process. First and foremost, the survey points to the institutional or school website as the essential information source for prospective students. Social media plays an important part too, particularly for gathering recommendations for institutions or schools and as a window into student life and student experience at a particular study choice. Even so, the survey respondents gave much more weight to institutional websites. Nine in ten respondents rated such official sites as “essential” or “very important” in their decision-making process, with only about 20% assigning the same priority to social media. The QS survey highlights as well the importance of responsiveness and authentic voice when engaging prospective students in online channels. For additional insights on this important aspect of online marketing, please see “Reaching millennials: Make it fast but keep it real” and “Always on: Marketing to today’s connected youth”. This entry was posted in Higher Education, Marketing, Most Popular, Research and tagged student enrolment, study abroad, universities with international students, education abroad, online marketing.